Mobile Link Wi-Fi remote monitoring lets you get and share information about your home standby generator. Access important information such as current operating status, maintenance schedule, historical information, and more directly from your smartphone, tablet, or computer. The Mobile Link Wi-Fi device comes pre-installed on your 2019 Guardian Series generator, just create your account on MobileLinkGen.com. It’s that easy. Ability to view the current state of your generator through your Mobile Link App or website. Receive active notifications (email, text, push) on your generator status. Receive 1 monthly email that reports on your generator status changes, faults and warnings. 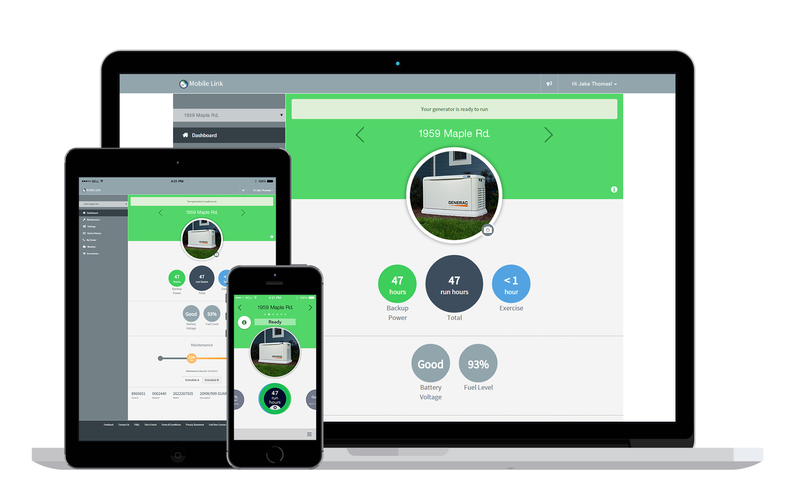 Mobile Link allows you to monitor the status of your generator on a phone, tablet or computer from anywhere in the world. Giving you the ability to connect your account to your authorized service dealer for fast, friendly and convenient assistance. *Dealer defines maintenance contract options. **Available as an accessory Cellular Mobile Link coming in August with an additional fee. Low cost and no cost subscription packages are available. 1 year of service for as little as $0. Mobile Link comes pre-installed with most 2008-and-newer air-cooled standby generators and 2018-and-newer Guardian Series air-cooled standby generators from Generac. NOTE: Please ensure you have Wi-Fi service capable of sending and receiving text messages in your area before purchasing.WiFi capability comes pre-installed on your 2019 and newer Guardian Series generator.